Ansonia Clock Co. Crystal Regulator, "Floral", ca 1914. Someone at Ansonia wanted to make a clock of nothing but flowers. Well they succeeded. You cant tell much from the pictures in the catalogs, but hopefully my picture will show you that the clock is nothing but flowers. I see many, many kinds of flowers depicted on this 16-1/2 inch metal case. It was completely restored by Bruce Baziluk, a few years back, in a Syrian bronze color. 8 day, strikes half hours on a hanging cathedral gong, running nicely. 2 piece porcelaindial is perfect, outside escapement with jeweled pallets. The 4 glasses arenot beveled because the bevel would be behind the metal flowers. 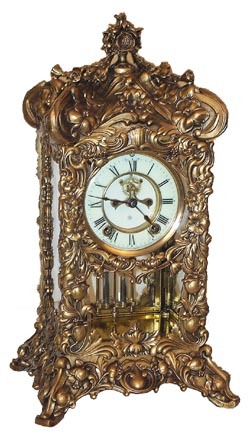 I have hadthis clock for a few years, in my collection, but I cant keep everything.Ly-Ansonia No. 116.